PR-100 Pro-Stock "Round Opening" . 42-1/2" Long, 18" Wide, 14-1/2 High. PR-200B "BLACK" Pro-Stock "Round Opening" . 48" Long, 17" Wide, 12 High. PR-300 Pro-Stock "Round/Flat Opening" . 48" Long, 17" Wide, 12 High. PR-300B "BLACK" Pro-Stock "Round/Flat Opening" . 48" Long, 17" Wide, 12 High. PR-400 "Gray" Pro-Stock "Round/Oblong Opening" . 45" Long, 15" Wide (less flange), 19-1/2 wide with flange, 11 High. "Oblong Opening: 8-3/8" wide x 6" high (ups ok) (K Style). Opening in bottom: 39-1/2" long X 15" wide. 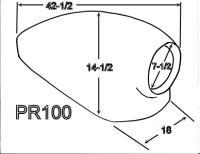 PR-400B "BLACK" Pro-Stock "Round/Oblong Opening". 45" Long, 15" Wide (less flange), 19-1/2 wide with flange, 11 High. Opening in bottom: 39-1/2" long X 15" wide. No "Top Seam" / "Mold Line" to finish off. The Best of Both.. Front open and Rear open! Features "open back" for Forcing air into rear. 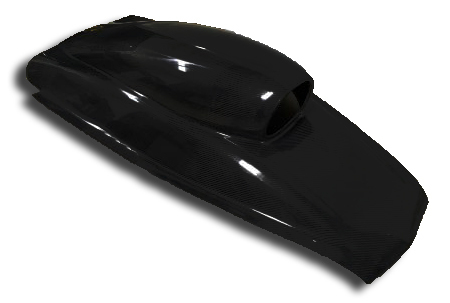 Aero-scoop allows air to enter front, greatly improving performance. Inside measurement at midpoint is 24-1/2"
The Best of Both.. Front open and Rear open! Features: "open back" for Forcing air into rear. SC-150 Straight cut mounting allows base to be mounted to a flanged aluminum carb plate. Most popular applications are for direct mounting to carbs (both for dragster and boat applications). All hand-laid in one piece from high quality fiber-glass materials. DS-125 New Aero-Drag scoop. Features 21 1/2" overall height. Designed to be mounted to carburetor air pan tray. Base is 19" x 11 1/2". Opening is 45 square inches. Rounded inlet provides for maximum air intake. Contoured rear interior helps to maintain air flow. New Pro-Stock "Round" opening . Front round opening 7-1/2" diameter. Smooth gray gel coat finish. 100% hand laid fiberglass. Consisting of gel-coat, fiberglass matting, fiberglass 'cloth' and high strength polyester resin. Bottom is open for molding to your hood. 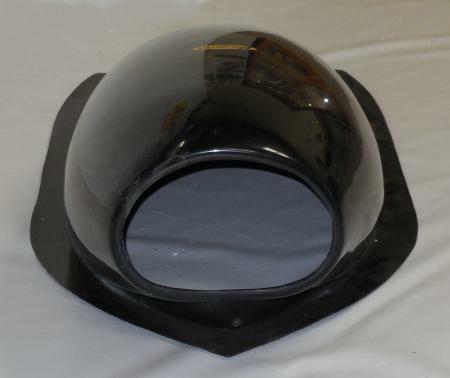 We offer mold-in of this scoop to almost any of our fiberglass hoods. We can install (mold-in) this scoop to just about any height you need. We simply cut the base to the desired size before molding in. Then we fiberglass the scoop into the hood from the bottom and finish the top side. Front to back position is also a custom operation to your specific needs. Please call for more info on our custom work. Front round opening 8-3/4" diameter. Ready to bolt to the carbs. 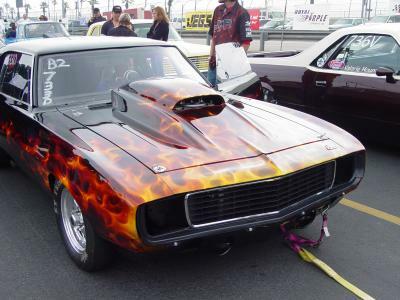 Then cut hood to fit around the scoop. Scoop stays on the carbs when removing the hood. 15" Wide (less flange), 19-1/2 wide with flange, 11 High. Opening in bottom: 39-1/2" long X 15" wide. No "Top Seam" / "Mold Line" to finish off. 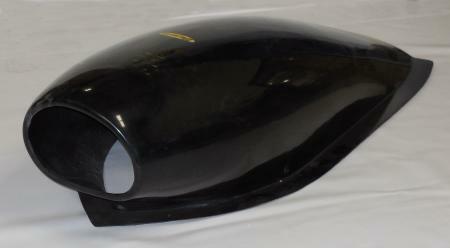 Carbon Fiber Aero-Bubble 12" high x 62" x23" wide. Smooth, black gel coat finish! The Aero-Top 2-piece snorkel is an inexpensive way to update your car. Overall height is 7". 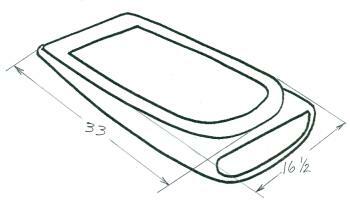 Consists of a base (2-1/4") and the Aero-Top (4-3/4"). Internal flange between base and top allows use of air pan kit and provides a strong bolting flange to hold the top section to the base. The top piece is #AT475. With a base measurement of 4-1/4" and the top at 4-3/4" the total height is 9". This 2- piece scoop has the same internal flange for carb sealing but allows extra clearance for high rise carburetion. Same as PR79, but has angled base. 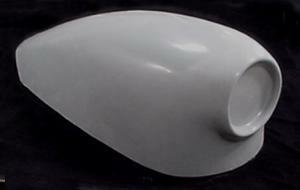 Base has external flange for bolting or riveting to hood, or this scoop can be bonded to the hood with fiberglass resin. 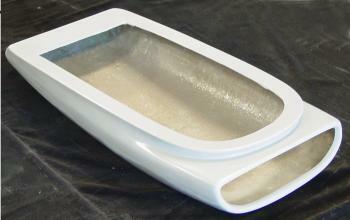 Scoop top is separate and has bottom flange for mounting to scoop base. We currently produce a large volume of these aero-scoops. All hand-laid in one piece. We have specially designed molds that allow us to laminate this item in one piece without `assembly' after it is molded. The bottom flange is straight cut to allow trimming this flange off to make the scoop the desired height. Overall height can be cut to 8" and still keep the aero design. Rear of scoop is closed off and baffle is optional. 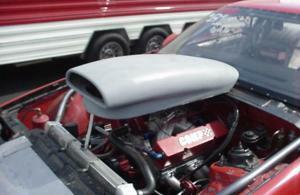 Aero-scoops allow for maximum air intake as well as low air drag. Opening 3-7/8" x 15". This scoop is supplied as an 11-1/2" tall scoop, but can be easily cut down to the proper height before molding into the hood. Minimum recommended height is 7". 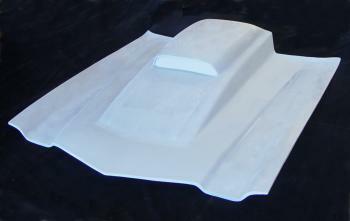 Straight cut base allows for proper attachment to any fiberglass hood. Mounting instructions are available upon request. Front opening size 3-1/2" hi x 14" wide. SC-210 Features: "Bottom Internal Flange"
New version of the famous aero-dynamic scoop. Back contour is completely redesigned for non-windshield length applications. Rear of scoop is 'rounded' for a smooth look. Opening is 14" x 3-5/8" and features smooth gel coat surface. Features 1-1/2" 'internal' bottom flange for bolting to carb plate or mounting to hood. As with all Unlimited's aero scoops, this one also has smooth top surface without 'mold-line'. Our 'no mold line' system will reduce paint prep time considerably, since there is no top surface mold line that has to be re-worked before painting. 8" high by 32" long. Newest version of our "Bolt on " Aero scoops. Features a widened width to 17-1/2". Height is 6". Front opening 3-1/2" X 15". Base is 16-1/2" wide x 33" long. Inside height at rear/base is 4-1/2". Height at farthest rear portion is 3-3/4"
This long aero-top will replace your existing 'square' style windshield snorkel top. It will bolt directly to your old base. The bottom of this scoop has a full flange with hole cut. Rounded air intake maximizes air flow while reducing drag. 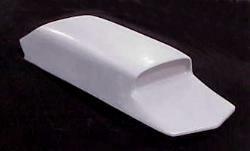 This scoop can also be mounted directly to a flat hood. Unlimited's exclusive new design, Aero-Top. We designed this scoop from a basic concept. 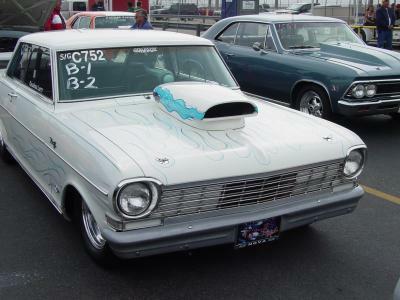 It offers an inexpensive way to modernize your old style scoop without buying a new hood and scoop. Underside has complete mounting flange. This item is fully hand laminated in one piece and is 4-3/4" tall. As a replacement for the old style square top, this Aero-Top will increase the overall height of your snorkel by 2-1/2 inches. Can also be mounted directly to a flat hood. Opening size 2-5/8" hi x 13-1/4" wide. Bottom view of AT475 Aero-top. 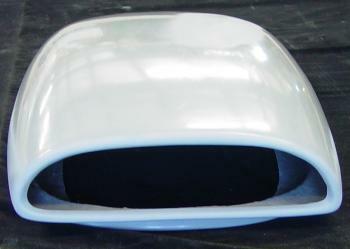 Bottom has full flange for mounting directly to standard flat steel hood or flat fiberglass hood. Oval hole in bottom can be cut larger if needed. Windshield snorkel with Aero-top. This snorkel features full fiberglass construction. Top and bottom sections feature internal flanges for carb sealing. Base has 5 degree angle and overall height is 9"
New bolt on Aero-dynamic scoop. This scoop features low profile (7" overall height). Has internal mounting flange for easy mounting to steel or fiberglass hood. Inside style mounting flange will not allow mounting bolts to show. This is similar in all dimensions to the SC204 & SC284 but is only 7" tall. Bottom mounting flange has slight curve to match the contour of the hood. New bolt on Aero-dynamic scoop. This scoop features low profile (8" overall height). Has internal mounting flange for easy mounting to steel or fiberglass hood. Inside style mounting flange will not allow mounting bolts to show. This is similar in all dimensions to the SC204 & SC284 but is only 8" tall. Bottom mounting flange has slight curve to match the contour of the hood. Internal flange or the SC-284 allows attachment directly to the top of a carburetor plate. Bottom view of internal flange of SC284. 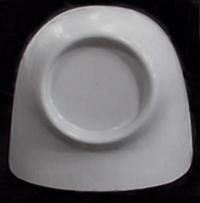 This flange is made as an integral part of the scoop. Bottom flange is 1-1/2" wide. Front portion of flange can be cut away if necessary to allow 'matching' of any body line or ridge in the center of the hood. This matching can easily be done with a jig saw or small hand saw, then filed or sanded to fit. Bottom flange has a slight curve (front to back) to match the hood contour. 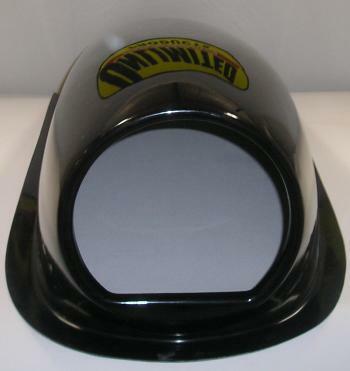 Hidden mounting flange allows for easy attachment to any fiberglass or steel hood. All of Unlimited's scoops with internal mounting flange can also be mounted to a flat carburetor 'plate' and hood can be cut out to clear the scoop thus allowing removal of the hood without removing the scoop. This scoop is also similar in size to the SC284 and SC204 but has internal mounting flange and is 9" overall height. 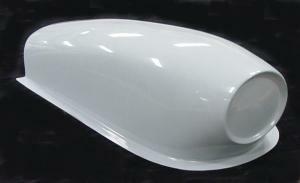 9 inch high Aero-Dynamic scoop with outside mounting flange. Flange is 2" wide, but can be cut down to desired width. Overall length of mounting flange is 37" and approx. width of mounting flange is 19-1/2". This scoop is used for mounting to a flat carburetor plate. Then a hole is cut into the hood to clear the scoop. 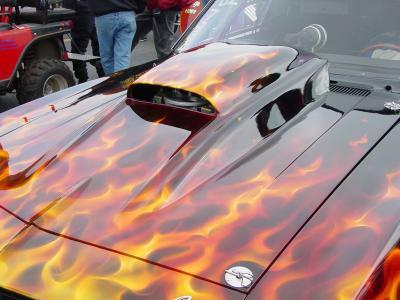 Hood can then be removed without removing the scoop, as the scoop stays attached to the carburetor plate. 40-1/2 long (overall length, not including flange). 15-1/2 wide (not including flange). Height at very back is 4". Height just inside rear mounting flange is 5-1/2". Boat scoop. Dimensions are 13 inches wide, 23-1/2 inches long and 7 inches high. Front opening is 11-1/2 x 3-3/8. Bottom is straight cut, no flange. Bottom is oval shaped and is 21-1/4 long X 13 wide. Boat scoop. Same as SC713, but has bottom flange for mounting. Dimensions are 13 inches wide, 23-1/2 inches long and 7 inches high. Front opening is 11-1/2 x 3-3/8. Bottom flange is 1-1/2" wide. Bottom is oval shaped and is 21-1/4 long X 13 wide. Boat scoop. Features bottom flange for easy mounting to a flat sheet-metal carburetor plate. Opening is 4 x 12. Base is 12 x 20 long. Overall length is 21-1/2. Height is 11-1/4. For boats and dragsters. Bottom view of ET-112 showing bottom mounting flange. Online Ordering: Use the Yellow "Go to Purchase" Button to the right of each item above.